It is finished! My Two Boms In One, that's what I'm calling it, is quilted and bound. It's not the best photo - both DH and I were too busy and forgot to take one when the light was best. 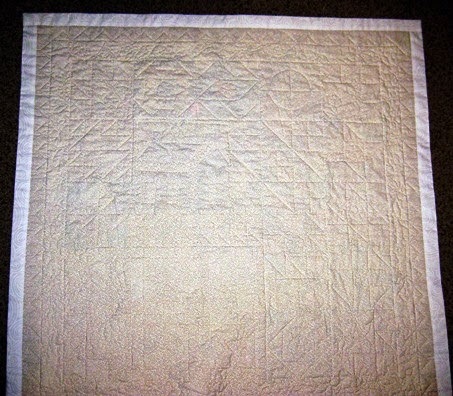 My using motifs from the fabric worked great for some ghost quilting, and filling in some of the white space. I chose to do a facing instead of binding as I wanted as much of the final border to show. I would have preferred a 2" border, but I just didn't have enough to swing it. Any way I learned a new way to do a binding around a quilt. 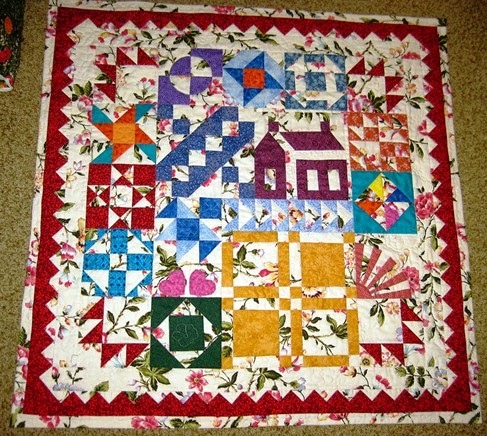 Used mostly in art quilts, I'm happy with it as this quilt will be a wall hanging. One WIP totally done for 2015! If you're wondering why I call it two boms in one, it's because I started the Just Take 2 BOM in 2011, but knew after just a few months I was not going to finish it. Too much life in the way. Then our Guild had a sampler BOM in 2014, and I continued making BOM blocks with the same background hoping they would mesh. They did! 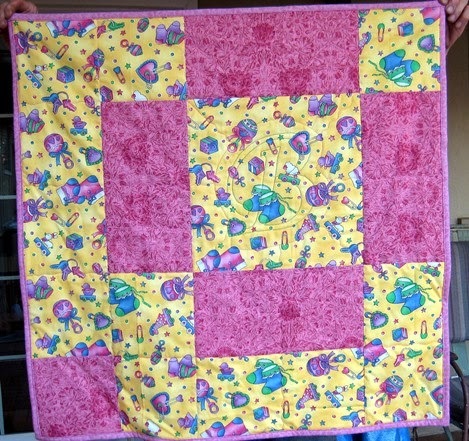 And for another finish - I finished another B3 Quilt. 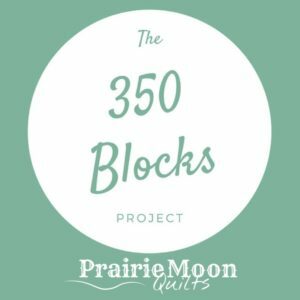 I'm designing a 30" quilt from one block for our Neonatal Community Service each month. The pattern is free for personal use only. You can find it on the right sidebar. I decided to quilt a big B in the center block. How are you doing on your wips? Would love to see - doesn't have to be a finish, but we'll admire those, too. Linky below - remember it doesn't have to be a new post, just one that shows your WIP. Ends Monday, midnight. Since I finished a flower I'm linking to Amanda's Finish it Friday, Lizzie's Free Motion Mavericks and Sarah's Can I get a Whoop, Whoop? Lots of eye candy there. I really like what you did. Two Boms in One is just amazing. They were meant to be together. Congrats!! First time linking up and commenting. I had to enlarge the picture to see that beautiful floral background print, gorgeous fabric! I love that background fabric and how it looks with all the sampler blocks. Oh, and I love that border. And, hey, love the whole quilt. Congrats on your finish. The list is growing each week! 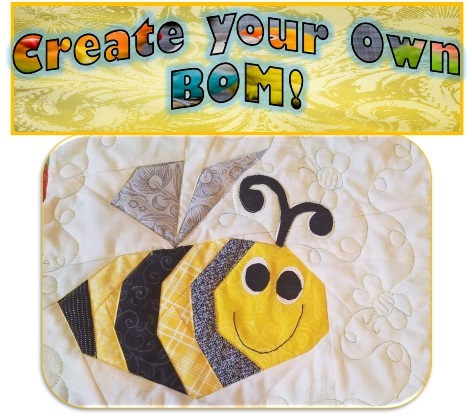 The Two BOMs quilt is just lovely and will brighten any room where it hangs. 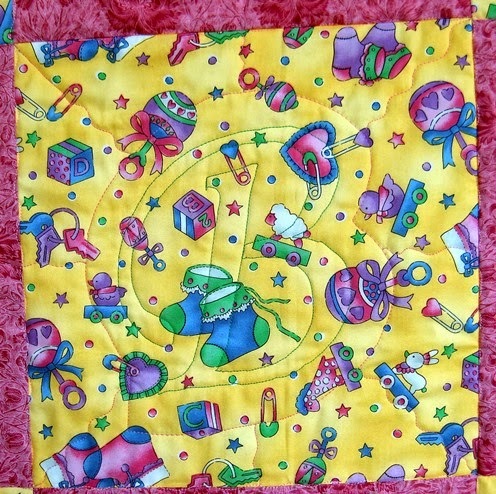 Love the baby quilt, too; very clever with that B. Your BOM quilt is gorgeous! I really love the background print. It makes this quilt. Angie, thank you for inviting me to link up with your WIPs Be Gone. I love seeing what others are working on. Your B quilts are lovely. What a great idea, to combine both BOMs. I keep thinking of trying out that facing method - I think you were right about keeping the border clean for this. Hello Angie - How wonderful, finishing a project with blocks you have had for such a long time and at the same time trying out the shadow quilting technique! It looks great, such cheerful colours to brighten up a room.